Main types of activity: production, wholesale, retail, own chain shops, import. Foreign partners: StefanplastS.p.A, JRS-J.Rettenmaier&Soehne , FLEXI-Bogdahn International GmbH & Co. KG, GONZALO ZARAGOZA MANRESA S.L.,EURO-ZOO Sp.z o.o., Tolsa Nederland B.V., BEST FRIEND GROUP Oy. Exclusive distribution: Flexi, StefanPlast,KIKI, Euro-Zoo, Kitty Friend, Hurtta, CHIPSI,CAT`s BEST, LINKY, Nutram. Occupied territory – 7000 sqr.m.+ 38 own chain shops – 1300 sqr.m. Company Biosfera was found in 1991 by group of enthusiasts lead by Alexander Pokrovsky. During 18 years of existence company has been dynamically developing. Company started from retail sailings, than became a manufacturer, and after it started wholesaling, import and export. For last two years number of importing goods increased in few times. Now, Biosfera is one of the biggest wholesale companies in Russia, successfully working not only in St.Petersburg and north-west region of Russia, but also with all Russian regions from Kaliningrad to Vladivostok, including neighbor countries. Biosfera Ltd. Presents on Russian market 15000 names of national and import products from the cheapest one which is available for everyone, to elite products from the world leaders, created for professionals. 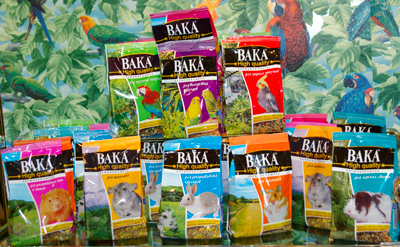 Company "Biosphera" is the owner of eight trade marks: «VАКА», "BioVaks", "BioFlor", "Gold-Premium", «Series 43», «Chistjulja VАКА», «Weekly-Quickly», «X-Element» which have deserved a recognition among owners of pets. The cosmetic line "BioVaks" made by firm "Biosphera", will help to solve set of problems connected with leaving and education of your pet. Shampoos of "Bioflor" are specially developed for those cases when the cat and a dog live at home together, as family. 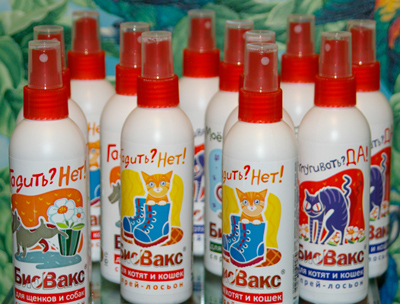 Among traditional shampoos «Series 43» created for care of the pet without water – special powders and gels. Cosmetics «Gold Premium» – elite professional shampoos and first-rate quality sprays. Antiparasitic collars «BioVaks. Parasites? No!» became a novelty of 2009. The great attention is given to exhibition activity. Practically at all largest exhibitions it is possible to meet and communicate to representatives of company. "Biosphera" traditionally takes part in the largest Russian exhibition "Zoosphere" which takes place annually in the autumn in expocentre "Lenexpo" in St.-Petersburg. 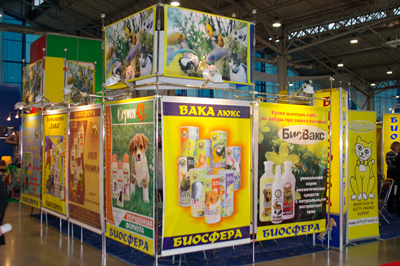 Also "Biosphera" are sponsors and organizer of many known exhibitions of dogs, cats, rodents.